Okay, so there's a lot more to relationships than enjoying good food together, but a dinner date night is classic. Whether it's date 1 or 1,001 cooking together is a great way to connect or re-connect. You get to bond together cooking in the kitchen - or at least set time aside to sit down and enjoy each other's company. So turn your phones off, head to the kitchen, and get cooking. Steak tends to be a “once in a while” or “because you deserve it” meal, not so much an “every Tuesday night” meal. 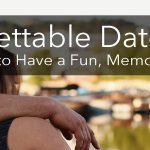 Therefore, it’s a perfect way to show your date they’re something special – whether it’s igniting those initial sparks, or rekindling a long time romance. 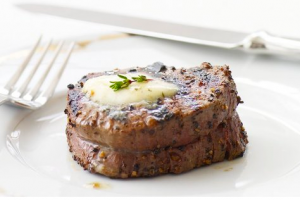 FoodandWine.com has a great assortment of steak cooking ideas. This is my favourite. Why have one thing when you can have a bunch of little different tastes? Admittedly, these will take a bit longer than just doing one dish, but tapas are my favourite way to do date night. 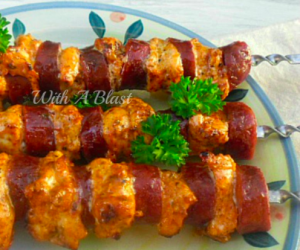 Eggplant bruschetta, chicken and chorizo skewers, and a classic cheese + meat plate (I usually just grab a couple things from Trader Joe’s – I also usually get some hummus too). 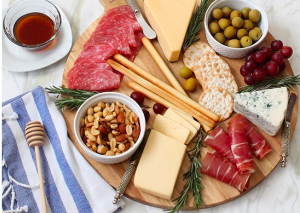 Mine never look this good, but if you want yours too click the picture for tips on making the perfect cheese board. Sometimes, you really really don’t have time to cook. Maybe you know you’re going to have a hectic day before your date night. Slow-cookers to the rescue! Throw it all in before you leave for work, and by the time you get home it’ll be ready for you. but LaurenGreutman.com has a ton of great slow-cooker recipes. 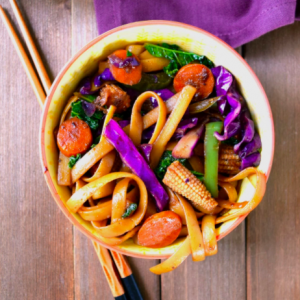 Whether you are vegan, you do “meatless Mondays,” or you just want to try out something different, these vegan Mongolian noodles hit the spot (and those baby corns are just so cute). I cook a lot of chicken in my day-to-day life, so when date night rolls around and I want something simple I turn to fish. It’s especially good for those warm nights or if you want to take a stroll after dinner as it doesn’t leave you feeling heavy. 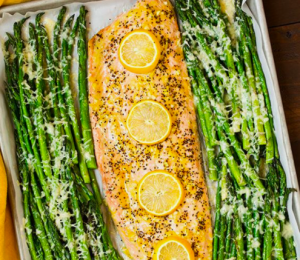 I love this lemon salmon and garlic parmesan asparagus recipe from cookingclassy.com (especially because you cook it all on one tray so there is less to clean up). 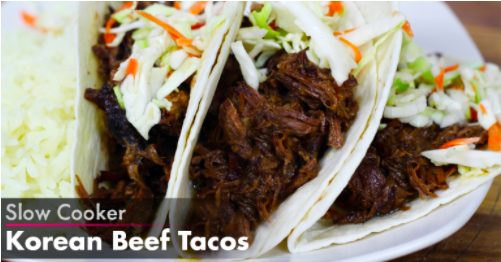 Living in San Diego we have a lot of Mexican food and Tex Mex in our diets. 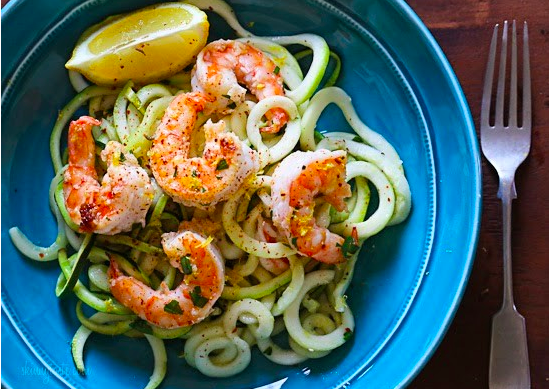 Most of the dishes we usually get out are pretty easy to re-create at home. 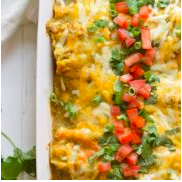 Try out these salsa verde chicken enchiladas from IsabelEats.com. Remember, dinner date night isn’t about the food, although eating a nice meal is a great bonus. It’s about connection. 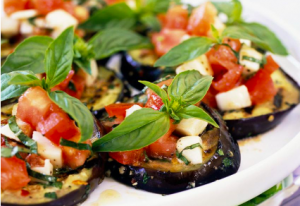 Set the time aside to really enjoy cooking together. If you’re schedules are truly too busy and you can’t both make the time, make sure you are trading off who’s cooking. Put away distractions — no phone, no television, nothing but you two and the food.